The University of Delaware is one of 12 land grant universities that have been selected by the U.S. Department of Agriculture (USDA) to serve as part of a New Hampshire-based Northeast Climate Hub. The climate hubs have been created to centralize information from universities and federal agencies related to climate change risk adaptation and mitigation. The hubs will address increasing risks such as fires, invasive pests, devastating floods and crippling droughts on a regional basis and translate science and research into information that can be used by farmers, ranchers and forest landowners to adapt and adjust their resource management. 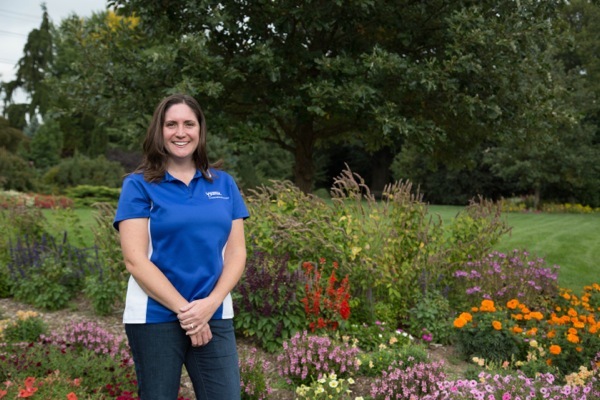 Jennifer Volk, a Cooperative Extension specialist, will serve as UD’s point of contact for the Northeast Climate Hub. Michelle Rodgers, associate dean for Cooperative Extension in UD’s College of Agriculture and Natural Resources (CANR), and Tom Sims, deputy dean for CANR, also will be involved with the hub. At UD, Volk and other researchers will first consider what farmers and land managers in the region view as the biggest climate risks to gain an understanding of their needs, as well as how they can help meet those needs both through research and Extension services. This information will be gathered through a survey being adapting to suit the Northeast that will be sent out in the near future. Volk also will share research that she has undertaken concerning salt tolerant crops with the hub, something she said is important for states in this region, especially those like Delaware that have many miles of coastline. Seashore mallow Volk’s research involves seashore mallow, a native wetland plant, as an alternative crop on salt-impacted lands. Of seashore mallow, Volk explained that it can be found anywhere along the East Coast, basically from New Jersey south, and then along the Gulf Coast all the way to Texas. “It’s a perennial; it’s basically a shrub so it comes back every year and it has a very pretty pink flower on it. It has seeds that are similar to soybeans, where about 20 percent of the seed is oil, so there’s potential for it to be used as a biofuel or cooking oil. We’ve been looking at potential uses for the stems, and poultry litter bedding is one of them,” said Volk. Researchers from across UD helped with the study, and the results could provide chicken growers with an alternative to using pine shavings for bedding, which are expensive and harder to find. Volk said that a preliminary assessment has already been completed with the help of Bill Brown, a Cooperative Extension agent for poultry. “We got Bill some of the stem material, went through the process of chipping it up to get it in nice, uniform pieces, and then he did a pen study looking at traditional pine shavings, sea shore mallow, Miscanthus and switch grass and comparing bird health, growth and paw quality under those four different types of beddings,” said Volk. Warmer weather Besides salt tolerant crops, Volk said that another important issue for Delaware farmers and growers is a warming trend that may continue into the future, making the state hotter on an annual basis and in the summer. This could affect both temperature and precipitation. “With climate projections, they’re very variable for precipitation but it looks like there is potential for more intense rainfalls and rain not necessarily occurring when crops need them. I think the potential for droughts and for flood outs are things that people can anticipate as climate continues to change,” said Volk. Volk added that Delaware has a great deal of irrigation and it is hard to predict the quantity of irrigation supplies if they have to be used to help offset the impacts of hot, rainless days. “The question is, do we know that we’re going to have the groundwater resources into the future if everybody is using it for irrigation at the rate that we’re using it now? It’s going to likely continue so those are the things that we need to consider,” said Volk. At UD, Volk said there are people doing climate-related research in the fact that they are working to improve production and help protect how production grows in the future. These researchers include Gordon Johnson, assistant professor in the Department of Plant and Soil Sciences (PLSC), and Emmalea Ernest, associate scientist the department, Richard Taylor, an Extension specialist, and James Adkins, an associate scientist of agricultural research and education who is doing irrigation work. As for what she is most looking forward to about working with the Northeast Climate Hub, Volk said, “I think connecting more with farmers and learning what their take is on climate change. I think a lot of people feel that farmers think ‘Whatever, climate change is going to happen, we’ll deal with it,’ but do they really think that there is anything to be worried about and what do they need from us as their trusted source of information.” Article by Adam Thomas Photo by Lindsay Yeager This article can also be viewed on UDaily.